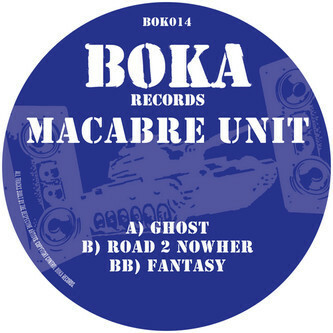 Boka steps up the pressure with another release of next level beat carnage, this time round coming from the legendary Macabre Unit. With previous releases on Plasticians Terrorhythm label and their own imprint, the Unit as usual employ take no prisoner tactics to their work with mangled beats and body blowing bass. First up is 'Ghost' a track that starts with teasing bass tones and then dops into pure mayhem with growling synths and head knodding beats. Over on the flip is 'Road 2 Knowhere' a track that goes straight for the kill - rough, raw, powerful and haunting.